The occupants of a car were fortunate to escape serious injury after their vehicle crashed into a deer on the main Creeslough to Dunfanaghy road on Friday night. The two men from Letterkenny were travelling towards Dunfanaghy when the adult deer ran out onto the main road right in front of their Ford Focus. The quick reaction of the driver ensured the car managed to avoid a head-on impact, but the car still struck the animal, causing serious damage to the vehicle. 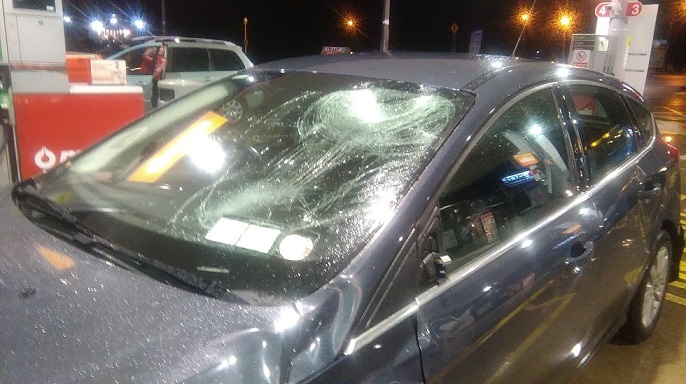 “We were lucky that we weren’t travelling too fast but we still couldn’t avoid hitting the deer because it ran out right in front of us,” one of the men said. The incident happened shortly after 10pm close to Dunfanaghy. The two men were shook up after the collision and the incident was immediately reported to Gardaí. It's understood the deer may have been injured, but ran back into the woods. The incident is a reminder to motorists to be aware of the dangers of deer coming onto roads, particularly in the areas close to Ards Forest Park and Glenveagh National Park.